A new space instrument was attached to the ESO's Very Large Telescope. The K-band Multi-Object Spectrograph (KMOS) has 24 robot arms that can study and observe 24 objects such as galaxies all at the same time. Space telescopes and instruments study and gather data about the Universe by observing the light emitted by these objects. Stars can be seen by the naked eye because of the light they emit. But as farther the objects are, the light from these objects move from visible light to the infra-red spectrum which is not visible to the eye. This is called the redshift. To explain redshift, it is best to compare it to hearing a police or ambulance siren. As the siren gets closer, the pitch gets higher, as the siren passes and moves away, the pitch goes lower. This is known as the Doppler effect. This Doppler effect works the same way with light waves, as the object is far away, the wavelength of light gets lower and moves toward the red side of the spectrum. Because of the expansion of the Universe, stars and galaxies are moving farther from each other which explains the redshift. Objects that move towards the Earth has their light waves shifting towards the blue end of the spectrum. Space telescopes like the Hubble and the VLT, observe distant galaxies by looking at the redshift. Precise calculations and sensitive telescopes can then reconstruct the data and present highly detailed images of galaxies, stars, and other objects in deep space. A powerful new instrument called KMOS has just been successfully tested on ESO’s Very Large Telescope at the Paranal Observatory in Chile. KMOS is unique as it will be able to observe not just one, but 24 objects at the same time in infrared light and study the structure simultaneously within each one. It will provide crucial data to help understand how galaxies grew and evolved in the early Universe — and provide it much faster than has been possible up to now. KMOS was built by a consortium of universities and institutes in the United Kingdom and Germany in collaboration with ESO. The K-band Multi-Object Spectrograph (KMOS), attached to the Very Large Telescope (VLT) Unit Telescope 1 at ESO’s Paranal Observatory in Chile, has successfully achieved first light. During the four-month period from August this 2.5-tonne instrument had been shipped from Europe, reassembled, tested and installed following months of careful planning. This was the culmination of many years of design and construction by teams in the UK and Germany, and at ESO. KMOS is the second of the second generation of instruments to be installed on ESO’s VLT (the first was X-shooter). "KMOS will bring an exciting new capability to the suite of instrumentation at the ESO VLT. Its initial success is a tribute to the dedication of a large team of engineers and scientists. The team looks forward to many future scientific discoveries with KMOS once the instrument commissioning is fully complete," says Ray Sharples (University of Durham, UK), co-principal investigator of KMOS. To study the early lives of galaxies astronomers need three things: to observe in the infrared , to observe many objects at once and, for each one, to map out how their properties vary from place to place . KMOS can do all of these things — at the same time. Up to now astronomers could either observe many objects at once, or map a single object in detail. A detailed survey might take years for a large sample of objects. But with KMOS, by mapping the properties of many objects simultaneously, such surveys can now be completed in just months. KMOS has robot arms that can be positioned independently in just the right place to catch the light from 24 distant galaxies, or other objects, simultaneously. Each arm in turn places a 14 by 14 pixel grid on top of the object and each of these 196 points collects light from different parts of the galaxy and splits it into its component colours as a spectrum. These weak signals are then recorded by very sensitive infrared detectors. This extraordinarily complex instrument has more than one thousand optical surfaces that had to be manufactured to high accuracy and carefully aligned . "I remember, eight years ago, when the project started how I was sceptical about the complexity of KMOS. 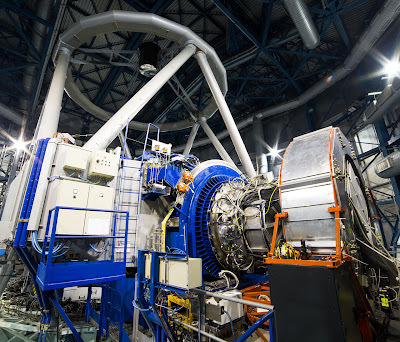 But today we are observing and the instrument is performing wonderfully," says Jeff Pirard, the ESO staff member responsible for the instrument. "Moreover, it has been a real pleasure to work together with the KMOS team. They are very professional and we had a great time working together." KMOS was designed and built by a consortium of institutes working in partnership with ESO. These are: Centre for Advanced Instrumentation, Department of Physics, Durham University, Durham, UK, Universitäts-Sternwarte München, Munich, Germany, the Science and Technology Facilities Council's UK Astronomy Technology Centre, Royal Observatory, Edinburgh, UK, Max-Planck-Institut für Extraterrestrische Physik, Garching, Germany, Sub-Department of Astrophysics, University of Oxford, Oxford, UK. "I am excited about the fantastic opportunities KMOS offers to study distant galaxies. The possibility to observe 24 galaxies simultaneously will allow us to build galaxy samples of unprecedented size and quality. The collaboration among all partners and ESO could not have been better and I am very grateful to everybody who contributed to the construction of KMOS," concludes Ralf Bender (Universitäts-Sternwarte München and Max-Planck-Institut für Extraterrestrische Physik, Germany), co-principal investigator. The expansion of the Universe shifts light to longer wavelengths. This means that much of the light from distant galaxies of interest to astronomers is shifted from visible-light wavelengths to the longer infrared wavelengths. To study galaxy evolution infrared instruments are vital. This technique, known as integral-field spectroscopy, allows astronomers to simultaneously study the properties of different parts of an object such as a galaxy to see how it is rotating and measure its mass. It also allows the chemical composition and other physical properties to be determined in different parts of the object. Most of the complex mechanisms in KMOS have to operate at -140 degrees Celsius, which creates major engineering challenges.